Aries’ lust for adventure is boosted by Leo’s love of life. Both of these signs want to be first, they just express it in different ways. Together they can pool their mutual confidence to create a fiery, vital relationship. 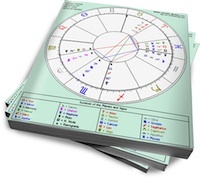 Sun in Aries takes the lead in his relationships. This warrior charges forward, expecting his partner to follow. He has no patience for hesitancy and will quickly move on if his lover can’t keep up. His focus is “I must do this” rather than “look at me” on his mission to challenge himself. His partner needs to be part of that challenge; Sun in Aries wants his experiences cranked up a few levels higher than most people. When he gets pushy, demanding or short-tempered, he respects a partner who pushes back. Moon in Leo glories in recognition. She knows she’s special, and her creative energy needs an audience. She feels everything on a grand scale, thriving on drama, passion and joy. If her partner sings her praises, she’ll respond with blazing warmth and unlimited support. But if Moon in Leo is disrespected, she’ll lash out and show just how wounded she is. Happy or hurt, she can be a confident, steadfast partner for the right person. Someone who feeds her inner fire will win her unshakeable loyalty. You’d think this pair would be a Clash of the Titans, but they don’t compete. Leo Moon expresses her energy through feelings, while Aries Sun takes overt action. Aries will dominate, and Leo will nourish his drive to push forward. He’ll be vitalized by Moon in Leo’s unwavering support and will respect her strong boundaries. He’ll also be pleased that he never has to guess how she’s feeling. Moon in Leo will be nourished by Sun in Aries’ appreciation and will respond instinctively to his courage. Each will feed off of the other’s initiative, boosting their respective desires for self-expression. My husband is Aries Sun and I am Leo Moon. This was so accurate! Thanks for writing these and providing the link on your blog.